Services of local trains were affected after at least 12 rail rokos at different places on both Central and Western Railway. As many as 170 train services were cancelled on both lines, others remained delayed throughout the day. The daily commute of Mumbaikars was interrupted Wednesday as the protest called by Dalit groups entered its second day. As services of major modes of transportation, including local trains and buses, remained disrupted during the day, many preferred to drive to their workplace. Services of the Brihanmumbai Electric Supply and Transport (BEST) were called off on six routes due to “trouble” anticipated on the roads. Traffic was disrupted in several parts of the Western Express Highway, Powai in JVLR, Kalanagar Junction in Bandra East due to “rasta roko”. Many were stranded outside Bandra and Kurla railway stations. “Finding a rickshaw from Bandra station to work was troublesome. Fearing protest, no rickshaw puller was ready to go till the suburbs,” Akshata Ghagare, who was heading to work in Bandra, said. Many BEST buses returned to depot after they were vandalised. The BEST plied 3,208 buses from a total of 3,370 scheduled. 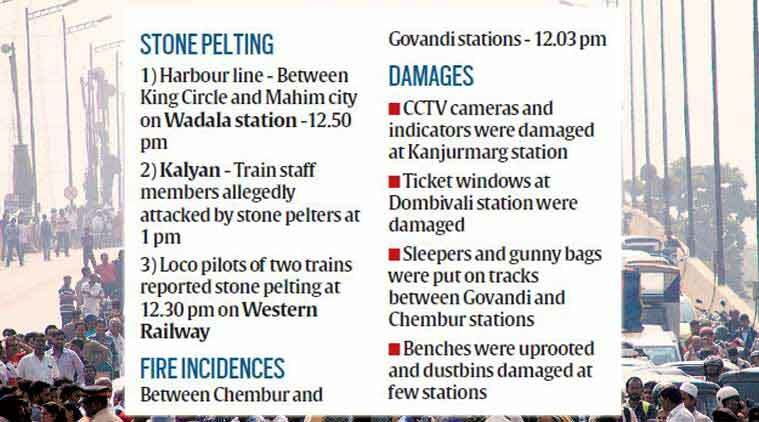 Officials said bus services were affected near Dindoshi depot, PL Lokhande Marg, Jija Mata Nagar in Worli, Bhandup, Bandra Colony, Sangharsha Nagar, Chindaivali, Khairani Road in Sakinaka and Akurdi Road in Kandivali. “Till 7.30 pm, 90 buses were damaged completely. As many as four bus drivers were injured. While 83 buses were affected in the protest on Tuesday, 90 buses were affected on Wednesday, making the total count of damaged buses reach 173 in the past two days,” Hanumant Gophane, the Chief Public Relations Officer, BEST, said. Owing to safety concerns, the Mumbai Metro One Private Limited (MMOPL) shut down services between Ghatkopar and Airport Road Metro stations at 11.30 am and resumed it only by 4.55 pm. “Protesters did not enter the station premises but they were crowding around the area. So, we decided to shut the stations as safety precaution,” said an MMOPL spokesperson. Commuters complained about not finding app-based cabs, including Ola and Uber, to commute in parts of Thane and Navi Mumbai. On Wednesday, at the airport, 16 departures and 16 arrivals were cancelled while autos and taxis resumed services from both the terminals. “While the impact of ‘Maharashtra Bandh’ was felt across the city today, Mumbai International Airport Private Limited (MIAL) undertook numerous measures and initiatives to ensure passengers travelling through Chhatrapati Shivaji Inter-national Airport (CSIA) were least affected… While flight operations were running smoothly, the absence of private cab operators and the limited availability of autos created inconvenience for passengers. To facilitate transportation of passengers from the airport to the nearest stations, MIAL arranged for services of the BEST buses from Terminal 1 & 2,” said a statement from MIAL. Many airlines said they would waive cancellation charges due to the protest. “In view of the ongoing unrest in Pune and Mumbai, applicable penalties of re-issuance, date change, no show, cancellation and refund charges for travel from/ to Pune and Mumbai for both domestic and international flights stand waived on all tickets issued on or before January 2,2018 for travel till January 4,2018,” an official statement from Air India read. 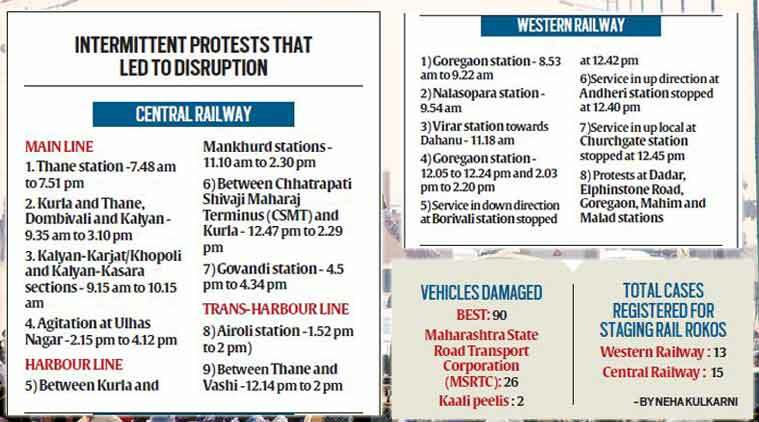 As many as 26 buses of the Maharashtra State Transport and Road Corporation were damaged due to the protest. Commuters complained about trouble in travelling in parts of Ratnagiri, Auran-gabad and Solapur. 37 bus depots, from a total of 250, remained operational in the morning hours, officials said. Bus services across the state resumed after 7 pm. Transportation of goods was also affected due to the strike. “Around Rs 2,000 crores is the loss to the road transport sector in the Maharashtra bandh. It is surprising that the Government has chosen to remain silent,” sad Malkit Singh, the chairman, All India Motor Transport Congress.